Live at the Crystal Ballroom, Portland OR, October 13, 2006. 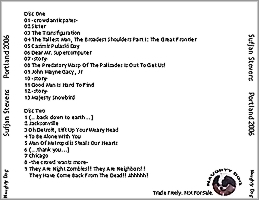 If Sufjan Stevens' KEXP show in July 2005 (click here) is considered minimalist, then his show at the Crystal Ballroom in Portland, Oregon on October 13, 2006 is nothing short of an epic. As Scott D Lewis wrote on the internet, "Backed by at least 15 musicians wearing butterfly wings, Stevens identified himself as their ringleader by wearing a set of large bird wings and commenting, 'You can call me the majestic songbird,' a reference to a gorgeous new song Stevens performed later in the show." The songs are drawn mainly from Stevens' Illinois album though tracks from Seven Swans, The Avalance and Michigan also appear. Onstage, Stevens does cut a commanding presence (Chicago, They Are Night Zombies) though he sometimes comes across both precious and exquisite in his delivery. While Stevens covers a lot of musical territory in his songs, he really calls to mind the lyricism and the hushed tones of Simon & Garfunkel. 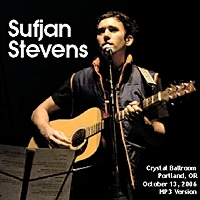 For those who haven't caught on to Sufjan Stevens, here is a chance as good as any. Click here to buy Sufjan Stevens albums.